This is me and my Bhutanese crush Tashi. We are in Bhutanese national dress. Tashi is wearing a gho (robe) which was hand-woven by his mum, crisp white laygay (cuffs) and the requisite kneesocks. I'm wearing a purple toego (jacket) embroidered with golden dragons, a black wonju (blouse) and a machine-woven kira (long skirt) in green and gold. How do we look? 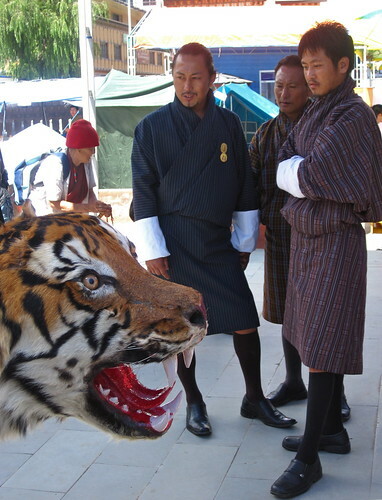 Bhutan is a quirky nation. There are a great many rules, regulations and bans which control everything from building styles to the availability of meat. One of the most obvious rules impacting daily life is Bhutan's dress code: all citizens are required to wear the national costume in public during business hours. Bhutan is the only country to enforce a dress code for both men and women. Three gents in ghos. I don't know them. Before we start talking about patterns and colours and the fun of fashion, it is worth mentioning the political aspects of getting dressed to go to work or school in Bhutan. The dress code requirement, part of the Driglam Namzha, became law in 1989 at a time when there was rising tension between different the ethnic groups within the country. The law was ostensibly created to promote 'one nation, one people', to protect an ideal of Bhutan's traditional culture, however, the dress code was met with strong resistance from southern Bhutanese people who objected to being forced to dress in the style of the northern Bhutanese. Certainly, not everybody is happy to wear the gho or kira, for some this is because it is not the clothing of their own culture and for others, it is because the garments themselves (especially the gho) can be really uncomfortable. The situation is extremely complicated and I don't fully understand everything at play but I want you to get that dressing in gho and kira is not just about personal preference or style. It is a political imposition. • I wanted to show respect for local customs. The other women at the office dressed this way, so I followed suit. • The way I dress at home doesn't pack up well and it also doesn't work in a conservative place like Bhutan. I'm into low-cut, knee-length dresses and tall boots. Better to play it safe and wear something I know is appropriate for all situations. Plus, packing enough for four months and three seasons is hard. • National dress is required to enter government offices and I had many meetings at various ministries, usually scheduled without enough lead time to let me rush home to change. • When dressed in a kira, I was better able to convey myself as a professional working on a legitimate project and not as a tourist wandering lost around the town. • I was in Bhutan, getting an amazing opportunity to live in a very different culture! What the heck, why not go all out and immerse myself? Besides, I like the look of the traditional style! The first time I shopped for traditional wear, I was accompanied by Ms. Tshering Pem whose congeniality I tested after she randomly added me as a friend on Facebook. 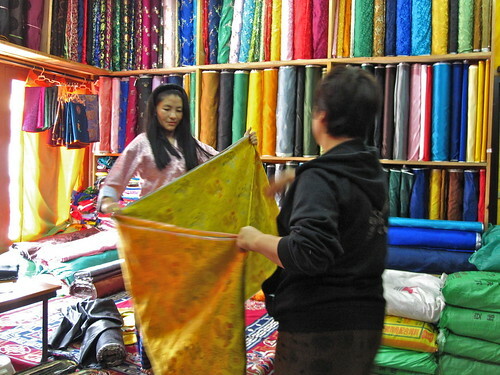 We started by picking out fabric for a kira (long skirt) at Sangay Bida Tshongkhang in Thimphu. Good thing Tshering Pem was there to save me from embarrassment: the first pattern I chose turned out to be the uniform fabric of the Taj Tashi Hotel! 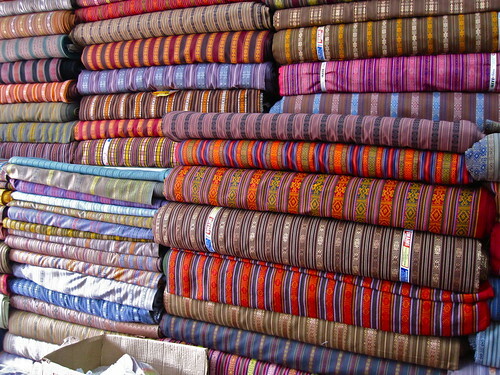 A length of machine-woven fabric for a kira costs 250 Ngultrum on average (about $5) but a complex hand-woven one could be over 100 times that price. I stuck with the affordable option. 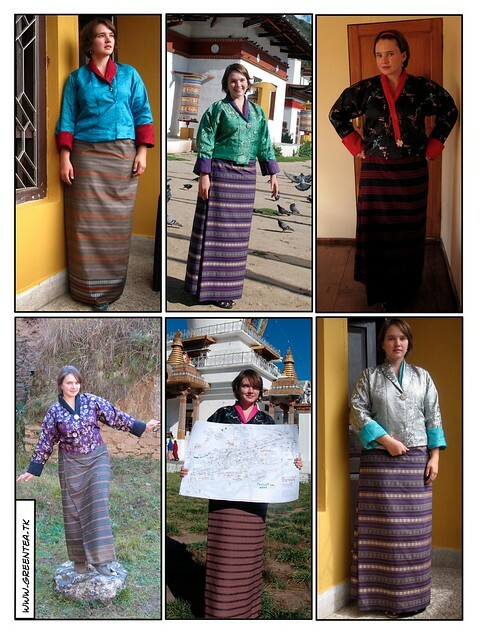 As you can see from the selection here, subtle colour and patterns aren't de rigeur in Bhutan. The kiras are traditionally meant to be held up around the waist with a wrapped belt, but I took the modern approach. I got my kiras tailored with hooks and Velcro for ease of dressing. The tailoring cost 50 to 100 Ngultrum ($1 to $2) each. Here are my six kiras. The green and blue ones have more ornate weaving at the hems, a detail which I really enjoy. 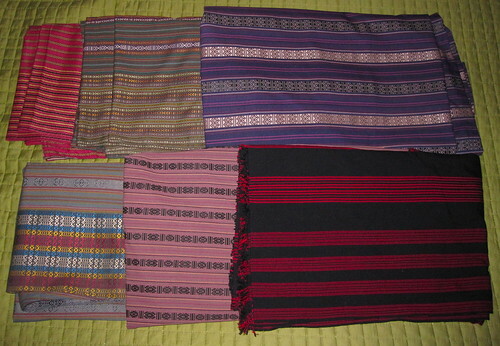 The red and black striped kira is the only hand-woven one, a gift from a friend. I gave away the top left peachy kira because it was ill-fitting. The next shopping stop would be a store that specializes in fabric for the toego (jacket) and wonju (blouse) or pre-sewn wonjus. Tshering Pem took me to a place in the Karma Khangzang Building that first day but there are lots of these stores around Thimphu, usually with all four walls lined with bolts of material in endless combinations of colours and patterns. I spent many hours browsing the brocade. It always felt like such an indulgent purchase, 2.5 metres of gorgeous embroidered fabric, but the price was usually around 250 Ngultrum ($5). I presume this material is manufactured in China. The fabric would have to be taken to a tailor have a jacket sewn up. 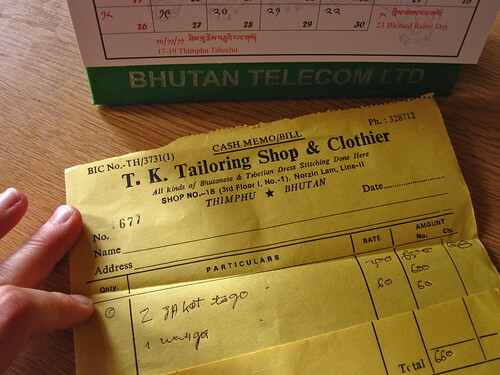 There are dozens of small tailoring shops operating in Thimphu. 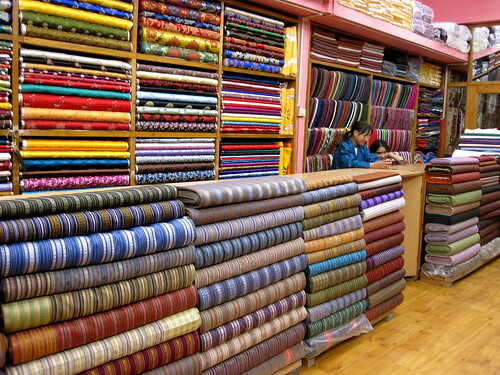 To stitch a toego, the cost would be between 50 Ngultrum and 300 Ngultrum ($1 to $6) depending on the customization of the fit. 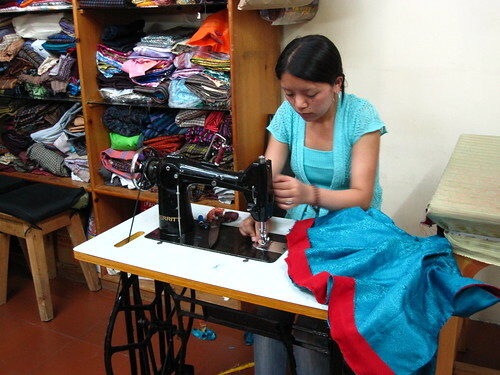 All the tailors work on foot pedal sewing machines. That's my red-lined blue toego being stitched up there. 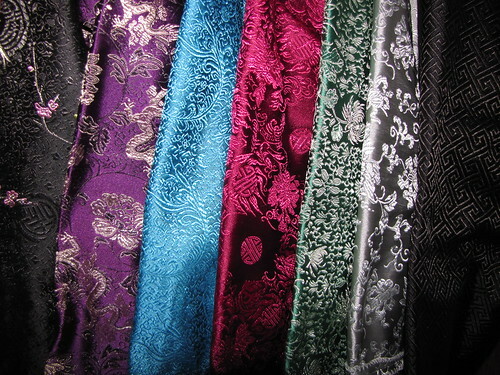 And here are all seven of my brocade toegos. I loved picking out these different patterns: cherry blossom branches, dragons, vines, good luck symbols, chrysanthemums, sacred vessels and Greek keys. 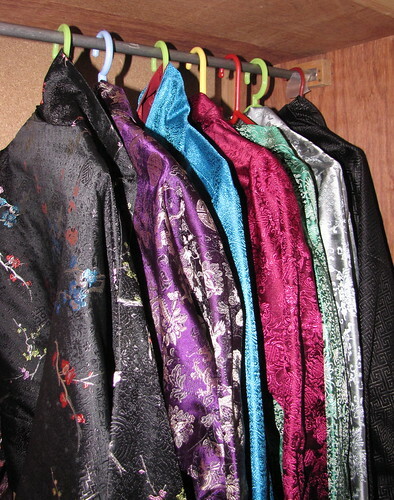 Here are my eight wonju (blouses). These were bought off the shelf for 150 to 300 Ngultrum ($3 to $6). 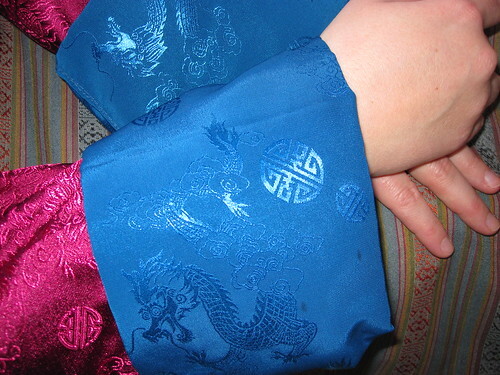 It's the wonju that creates the distinctive pop of contrasting colour at the cuffs in Bhutanese women's fashion. The interest is heightened by the different textures and patterns of these light satin blouses. 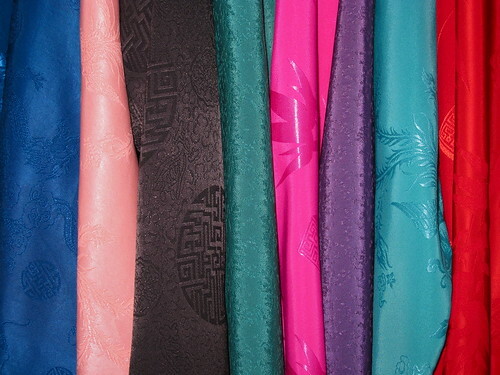 Mine have motifs of dragons and phoenixes, bamboo leaves, Chinese symbols and so on. There are quite a few ways to fold the collar down over the toego. This is tricky to master because the toego (jackets) are usually stiff and boxy in fit while the wonju (blouses) are of very fine material. Brooches and safety pins are essential accessories for creating structure and hold. • Initially, I intended to buy a capsule wardrobe for my months in Bhutan. Maybe three skirts, three jackets and three blouses in complimentary, interchangeable colours. Greens, purples, blacks, perhaps? But when I got into the shops, I started buying whatever I found appealing. I found the fabric and tailoring to be cheap - I could get an entire tailored outfit for the cost of a weekday lunch in Toronto - so it was tough to resist buying more. I did end up paying for it via excess baggage fees, eventually. • As a fuller figured girl, I'm used to dressing in a particular way to flaunt my better features and conceal others. I wear low cut necks and cinch my waist to draw attention upward. The boxy jackets and straight-cut skirts I was wearing in Bhutan did not allow me to dress for my shape. I ended up looking like a solid column of woman! The ubiquity of horizontal stripes for kiras was also troubling - I wouldn't dream of wrapping my backside in eye-catching stripes like this by choice. It was a bit of a strain on my vanity to put up with wearing unflattering fashion everyday. The lively colours helped to make up for this. • I noticed that Bhutanese women didn't have the same concern about matching colours that I do, or perhaps that they have a different idea of what colours look good together. Also, I don't usually wear more than one pattern at a time but with the kira, toego and wonju, I got used to wearing three different patterns together. I wish I had taken more photos because many of my friends turned themselves out beautifully every day, dressed in combinations I never would have thought of. • As anyone who has ever worn a school uniform can tell you, there are ways to express individual style even if everyone is dressed similarly. Uniqueness comes out despite the restrictions of the Bhutanese dress code: preferences for colours and patterns, brooches or pins, funky kneesocks for the guys, the fit of the jacket and the fold of the collar and so on. It is rather fascinating to observe. • Dressing in such a different style from my norm back in Canada, the clothing always affirmed that in Bhutan, I was not living my same-old regular life. I really had fun with Bhutanese fashion and it was an enjoyable aspect of my extended stay there. However, there were days when I was feeling frustrated, misunderstood or overwhelmed by my work and I'd glance down to see those ferocious dragons swirling across my sleeves. Somehow, the dragons always brightened my mood. this is fascinating. i love the scarf you sent me and can now speak about bhutanese fashion when people comment on it. though i'm not sure how i feel about the idea of a national dress code, at least the clothes were colorful and interesting (imagine a canadian equivalent...). i also think you look truly fantastic in some of those outfits, despite your misgivings. p.s. i had no idea bhutanese men were so uniformly handsome. Great post! Really informative. And you do look wonderful in all of the outfits. Really interesting post, and you manage to look as stylish as ever! I imagine that in a way, the restrictions can actually open the way for more freedom. I used to have a pair of trousers with a dragon on the back of one of the legs... I really loved it. Very interesting that in Bhutan there is a dress code. The patterns and bright colors together are beautiful. 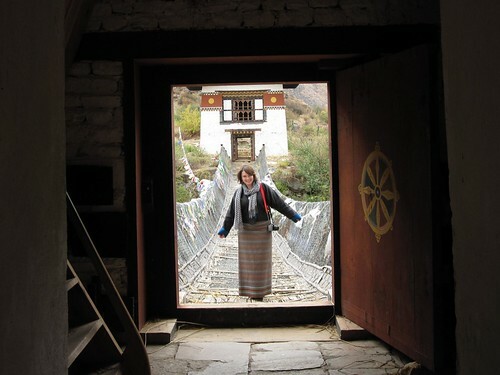 Hello, I stumbled on your blog because Bhutan had been an interesting subject I pondered on for the last several month. Is it possible to find the sewing pattern for the wonju and kira and toego online? Since going to Bhutan is still a far fetched dream, it would be awesome to be able to make the whole dress while waiting for the dream to come true. I have just returned from five weeks in Bhutan, and I have a half kira length piece of cloth that I didn't have time to have made into a kira I want to sew it (with velcro and hooks), but I don't have a pattern. I would love it if you could take a picture of one of yours that is made up so that I could see how it is made! Great post. I never knew anything about Bhutan other than where it was but I do now. Having a dress code seems strange, a bit like wearing a school uniform! I am now a lot wiser on the intricacies of this little nation.